A learning experience like no other. The NPR internship program has a rich history, helping us discover nearly 10% of our current staff including Ari Shapiro, Audie Cornish, Guy Raz and many more. From Day 1, interns at NPR are given real-world, hands-on responsibilities. 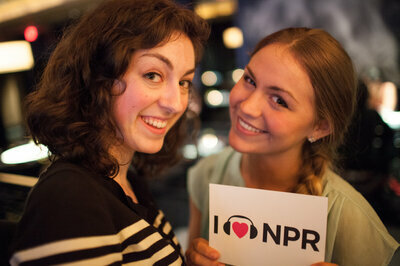 Working alongside top professionals in the field, interns do meaningful work across a variety of departments at NPR. Find out how you can contribute your diverse talents to gain invaluable experience at the heart of a thriving multimedia organization. Interns at NPR play a vital role in NPR’s daily operations in almost every division of the organization – from NPR News and Music, to Communications and Engineering. Interns are also offered training opportunities. And here’s the best part — you don’t have to be an intern to start learning. You can access NPR Training’s free website today. We are looking for students and recent graduates who are smart and creative, good researchers and excellent writers. Interns need to both work well on diverse teams and thrive with individual assignments. Candidates don’t need to know everything about NPR or public radio, but it helps to be at least a little familiar. And it doesn’t hurt to love NPR. For more details on unique requirements for individual internship positions (cover letter, writing sample, design portfolio for example), see the internship descriptions for more details. Interns are expected to work full time (40 hours per week). However, during winter/spring and fall semesters, part-time interns (at least 20 hours per week) will also be accommodated. All interns are paid $13.25 per hour. The amount received during the internship is based on hours per week and the length of the internship period. Candidates don’t need to know everything about NPR or public radio, but it helps to be a least a little familiar. And it doesn’t hurt to love NPR. Interns may also receive academic credit. NPR does not offer transportation or housing assistance. Internship positions are offered at our national headquarters in Washington, D.C.; NPR West in Culver City, CA; at the New York and Chicago Bureaus; and in Boston, MA. The location is listed in each of the internship descriptions. Many Member Stations offer internships of their own: check your local station’s website for details.